Whenever I see a wolverine or tank who has a fond love of claws I think of Daggz. 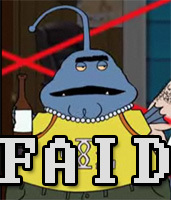 Whenever I see a slutty PPU I think of Faid. Whenever I see a slutty APU I think of Bray. Whenever I see the little guy following either of those slutty monks around holding his pocket I think of Derri. Whenever I think of a multitasking god in trade and combat I think of darling Mace.